John Walsh on the garden wall at Eshald Place. John Walsh grew up living in the last house on Eshald Place in Woodlesford overlooking rhubarb fields and a view towards Swillington in the days before the land was turned into the All Saints council estate. Some of his memories stem from the period during the Second World War when it was possible for children to roam on their own from Fleet Mills to Temple Newsam. In those days John and his “gang” could play out all day often with their parents not knowing where they were. Sometimes they swam in the canal or the quarry. Other activities were fishing for sticklebacks in the shallow lakes formed between the pit slag heaps or wandering miles in search of conkers. As a young boy John played at “cowboys and indians” and “kick out can” with other kids in the street. As a teenager he remembers billiards at the Oulton Institute and Saturday afternoon visits to the Ritz cinema. John’s father, Edward Walsh, was a Lancashire man who had come to Woodlesford in the 1920s to work in the bottling department at Bentley’s brewery. He had been born in 1900 into a working class family in the Pendleton district of Salford where his father worked mainly as a printer’s labourer. 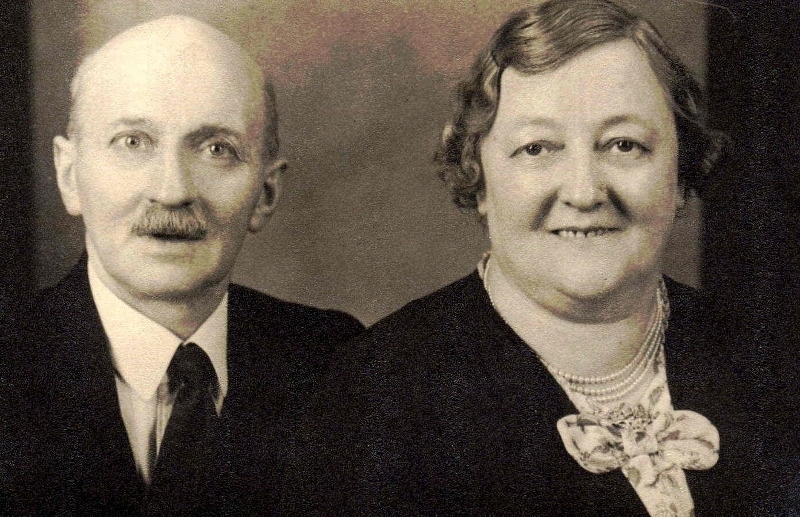 Quite why Edward crossed the Pennines isn’t known but through a friendship with his foreman, Raymond Wilson, he met and married Raymond’s sister, Mary Ellen, known as Nellie, and they married at Oulton church in 1932. 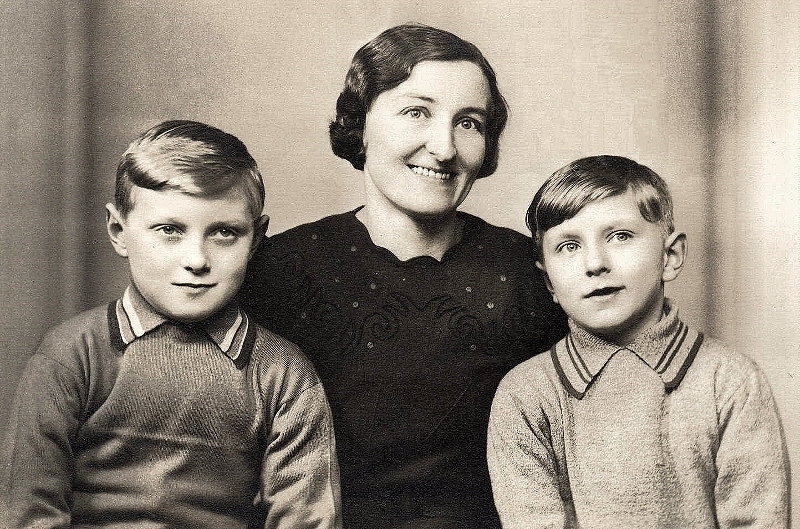 Kenneth and John Walsh with their mother Nellie in 1941. 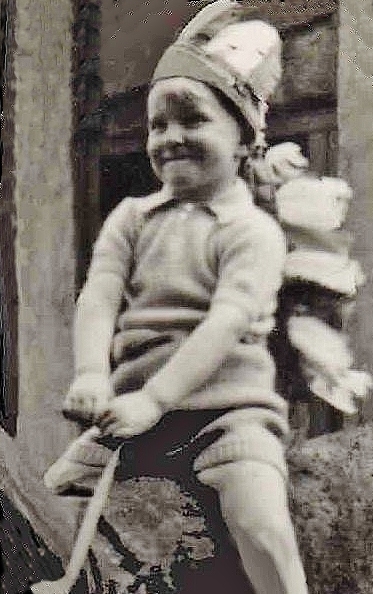 John’s older brother, Kenneth, was born in 1933 and John followed in 1935. 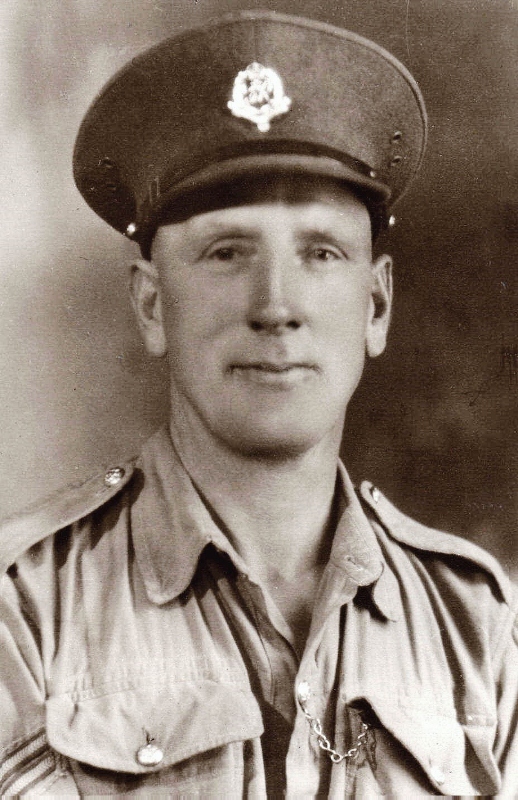 A third brother, Michael, didn’t arrive until 1948 after Edward Walsh had been away from home during the Second World War. During that time he served as a military policeman guarding German prisoners in North Yorkshire before moving to the docks at Liverpool and then on to North Africa and Italy. Most of John’s childhood was spent living at the home of his grandad and grandma Wilson at 88 Eshald Place. Tom Wilson was born out of wedlock at Methley in 1877 and was given his mother Ruth’s surname. Her father came from Outwood but worked for most of his life at pits in Allerton Bywater and Astley, rising to become a deputy. After giving birth to two more illegitimate sons, in 1892 Ruth married Septimus Dennison, a brewery labourer from Oulton. She took her sons to live with him on White Street in Woodlesford and together they had three girls. Tom went into the pits when he was 14. He was still working at Water Haigh into his seventies and John remembers him as a “gentle soul.” However he was closer to his grandma, Nellie Wilson, who also grew up in a mining family. Her father, Samuel Carrington, came from Ocker Hill in Staffordshire and her mother, Annie, was born in Worksop in Nottinghamshire. Nellie was born at Hemsworth and later lived at Pepper Road in Hunslet indicating her father moved several times in search of work. Sometime before 1901 they moved to Allerton Bywater which is probably where Nellie met Tom marrying him in 1904. By 1911 the Carringtons were at Eshald Place, a move which coincided with Samuel going to work at Water Haigh which had just opened. One of his sons, Walter, followed his father into mining but another, Arthur, became an assistant in the grocery department at Woodlesford co-op. Books were few and far between in Eshald Place and John learned to read from stories in The Hotspur and The Wizard which were published every week. There weren’t that many books at Woodlesford school either. There was no library and each class had its own set of textbooks. Pupils took it in turns to read out loud which was embarrassing and a struggle for some of the less able. Arithmetic and spellings were written on a blackboard in chalk and there were no visual aids except a large map of the world coloured mostly pink to denote the British Empire. Physical education consisted of “physical jerks” in the playground or an occasional team relay. When it was frosty the children used to makes slides on the sloping playground often bumping into the stone wall at the bottom. An air raid shelter was built at the start of the war and the whole school practised getting into it quickly, although, apart from the odd stray bomb, the area was spared from any German attacks as the Luftwaffe made for the larger targets in Leeds. In 1945 John passed an examination and was one of a few local children to win a scholarship to go to Rothwell Grammar School where his brother had gone as a fee paying pupil two years earlier. The scholarship came as a relief to his mother who would have found it hard to afford more fees. 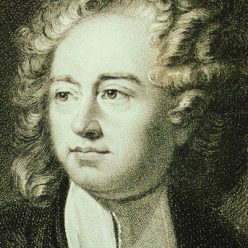 At the grammar school John was put in the top form where he learned French, German and Latin but his favourite subjects were geography and history. He also took up rugby which he played for the next 20 years. After passing the General Certificate of Education he decided not to go into the sixth form and left when he was 16 to look for a job. Two years later he was called up for National Service in the RAF and after training to become a wireless operator and direction finder was posted to Germany where he played a small part in the Cold War intercepting East German and Russian military signals. He returned to train to become teacher at college in Sheffield. His first appointment was in 1957 as geography teacher at Stanley Secondary School where he stayed for three years. After teaching at several other schools in Morley and Wakefield he moved with his young family to Birkenhead where he spent the rest of his career. Click on the links below to listen John Walsh reminisce about his childhood in Woodlesford. Edward “Teddy” Walsh served as a military policeman in the Second World War.